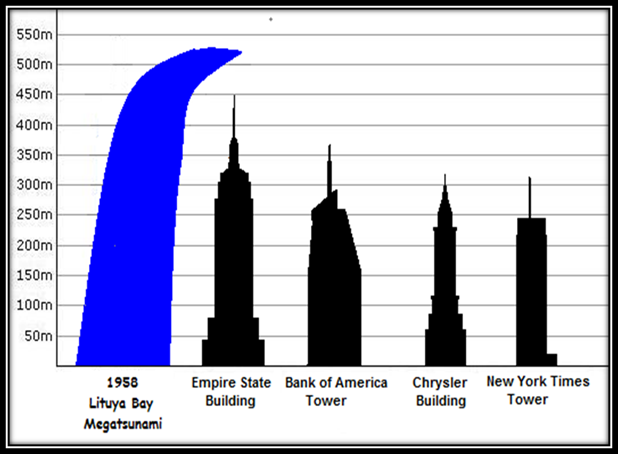 A Documented Tsunami of 1,722 feet (525 meters)! | Chaos Sweeps Away the World We Know! The Disaster, current events & Catastrophe Blog. Forecasts for 2014 to 2022. Read tomorrows news today! Plus current economic, commodities, stock indices and financial news. 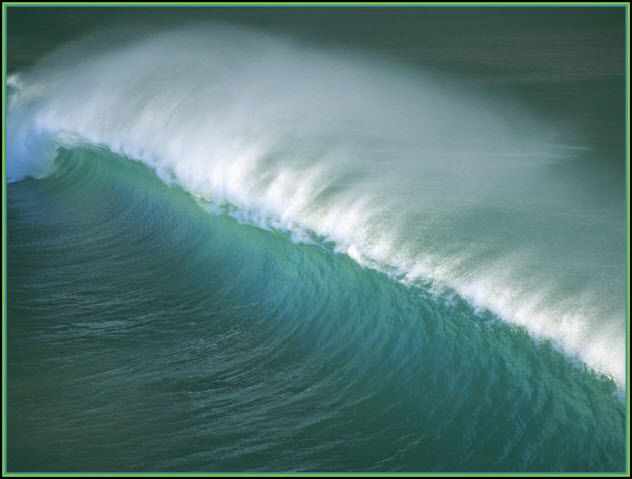 Huge tsunamis are not only possible but have occurred in the past. Imagine how big a tsunami would be if a meteor struck the ocean! The results to the major cities on the coast would be catastrophic. However, huge tsunamis are possible without space objects striking the ocean. Earthquakes, volcanoes and/or Landslides are capable of producing tsunamis of immense size as follows: Japan 3/11/11 (128’), Sumatra 12/26/04 (167’), Krakatau 8/27/1883 (115’), Prince William Sound, Alaska 3/28/64 (220’). 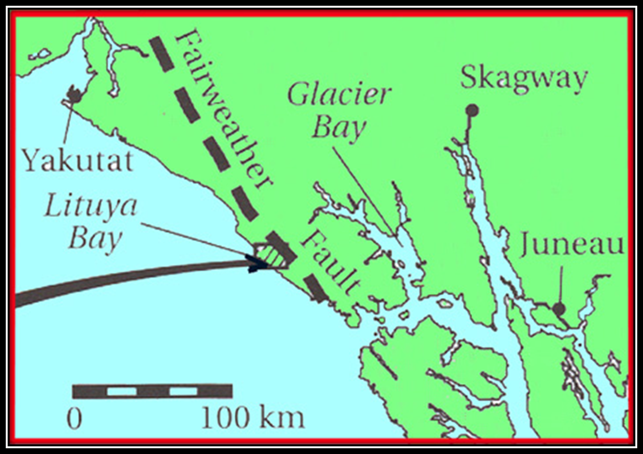 Lituya Bay, Alaska has seen other large tsunamis as follows: 10/27/1936 (490’), 9/10/1899 (200’), 1853 (394’), and 4/28/1771 (280’). Tsunamis are one of the most devastating natural disasters, as brought home to the world by the well documented Japanese mega-quake and tsunami of last year. This entry was posted in Alaska Earthquakes, Earthquake, Indonesia, Japan, Landslides, The Master of Disaster, United States, Volcanoes and tagged alaska, Craig Alaska, Earth Sciences, Lituya Bay, prince william sound, tsunami, United States, United States Geological Survey. Bookmark the permalink. 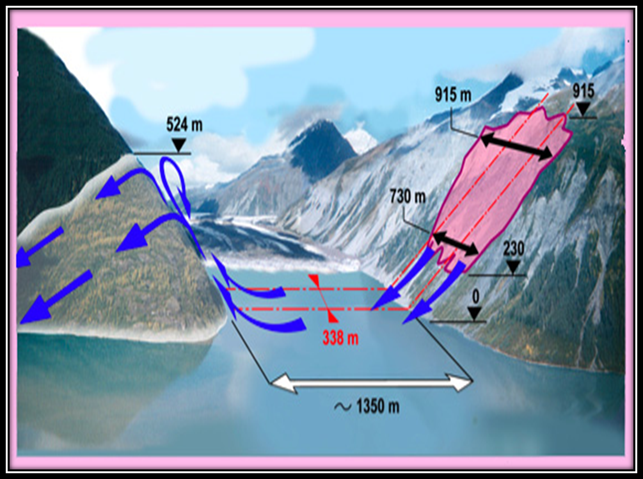 1 Response to A Documented Tsunami of 1,722 feet (525 meters)!